Dec. 1st, 2008 Blogmeister's Note: I received this e-mail message from Melanie on Dec 1st, in response to my e-mail requesting news of her tests results. She replied, "I have gotten my results back and everything is A OK!!!!!!! Negative on everything. Also, I don't have to go back for 6 months. That is a first. You can't believe what a relief that is. •Granddaughters Lauren (6) and Morgan (18 months) belong to Scott and his wife, Lori of 13 years. •Scott is an attorney with Oaks, Hartline and Daley out of Houston and runs the office here in Austin. Good afternoon all of you. This is great and thank you Karla for a job well done. This is a lot easier than emailing everyone. Looking forward to hearing from all of the "ole" classmates. I am one of the ones that will hit the big "65" in December. Wish I was going to Maui instead. Ha! Ha!. 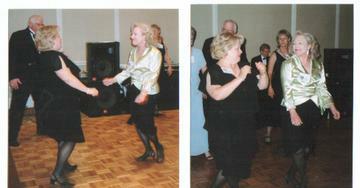 Melanie and Sandy Payne Bannister stole the show more than once at the 45th reunion! The following are comments that have been written in response to and with concern for Melanie over the last few months. Within these we learn the good news from Melanie's Early August visit to MDA. “Has anyone heard from Melanie W. since her tests at MDA? Melanie, speak up and let us know how you did. Please take the time now to make a comment in response to Melanie's biography. You will also enjoy reading the comments that others have left. So glad to hear about your latest test results. Think about you often and you are in Butch's and my prayers. Hi Sherri, good hearing from you on the blog. Why don't you send in your bio and let us hear more about your life after graduation from Milby. Look forward to seeing you in April for the BIG 50 REUNION. I enjoyed seeing you and talking with you at the reunion. I feel bad about not dancing with you, though. I guess I still have some self-confidence to work on.